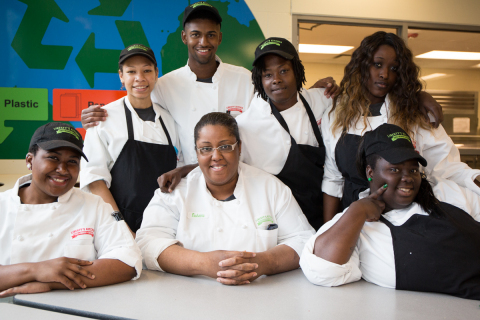 Liberty’s Kitchen trains motivated young adults to access employment and education in New Orleans. Photo courtesy of Liberty's Kitchen. LOS ANGELES--(BUSINESS WIRE)--The board of directors of the Conrad N. Hilton Foundation announced today that 24 grants and two program-related investments were approved, totaling more than $38 million during the fourth quarter of 2018. These grants and program-related investments were awarded to 26 organizations spanning across the Hilton Foundation’s priority areas, both in the U.S. and internationally. Safe Water – World Vision will receive $3 million to implement rural sustainable water, sanitation and hygiene (WASH) services in the district-based program of Asutifi North in Ghana. Water4 was awarded $500,000 to develop and implement a Safe Water Enterprise model in Wassa East, Ghana. Splash International was granted $2 million to refine and implement a WASH in Schools model in Addis Adaba, Ethiopia. WSUP Advisory CIC will receive $3 million to support the Mid-Western Umbrella of Water and Sewage in Uganda to play its new role as a Water Authority for 800,000 people. Young Children Affected by HIV and AIDS – Ideo.org was awarded $1.5 million for the Siaya Communications Campaign. United States Fund for UNICEF was granted $4 million to integrate early childhood development measure and data as part of health systems. Foster Youth – The Children’s Law Center of California will receive $1.05 million to expand the Crossover Advocacy and Resource Effort program that assists foster youth in Los Angeles who have become involved in the juvenile justice system. The Coalition for Responsible Community Development was awarded $1.125 million to increase the college and career readiness of youth aging out of foster care in South Los Angeles. iFoster Inc. was granted $1 million to improve and continue to deliver resources through the online Transition Age Youth Assistant, which provides linkages to careers and college through a digital locker for foster youth. New York Foundling Hospital will receive $1.545 million to offer educational support for foster youth from 8th grade through college through the Road to Success Program. Homelessness – Downtown Women’s Center was awarded $570,000 to strengthen the capacity of the Domestic Violence and Homeless Services Coalition to effect systems change towards better serving the need of domestic violence survivors experiencing homelessness. Genesis LA Economic Growth Corporation will receive $1.125 million to support Genesis LA’s investments in new and lower cost strategies to finance affordable housing for individuals experiencing homelessness through its RETHINK Housing initiative, of which $750,000 is a program related investment and $375,000 is a grant. Hospitality Workforce Development – Jobs for the Future was granted $500,000 to support partners in New Orleans to develop high-quality workforce training, align career and technical education, and improve postsecondary education that will address the needs of opportunity youth in the hospitality industry. Liberty’s Kitchen received a $500,000 program-related investment to increase organizational capacity and financial stability. Substance Use Prevention – American Academy of Pediatrics will receive $1.2 million to strengthen data collection, training and implementation of screening and early intervention services in pediatric settings. The University of New Mexico was granted $750,000 to continue efforts to implement, evaluate, and establish best practices for youth Screening, Brief Intervention and Referral to Treatment (SBIRT) in School-Based Health Centers in New Mexico. Anne Arundel County Mental Health Agency Inc. was awarded $600,000 to continue efforts to implement and evaluate the integration of adolescent SBIRT in Maryland as part of the state’s opioid response. Legal Action Center of the City of New York, Inc. will receive $750,000 to conduct policy and advocacy activities to strengthen access to screening, early intervention and the full continuum of substance-use-related services for young people. Center for Social Innovation, LLC was granted $1.5 million to evaluate a peer-based SBIRT approach. Avoidable Blindness – Sightsavers, Inc. will was awarded $2.5 million to support the national trachoma elimination program in Tanzania. Disaster Relief and Recovery – The Center for Disaster Philanthropy will receive $1 million for general operating support. Catholic Sisters – Indiana University was granted $800,000 to support a second cohort of congregations through the Advancing Mission fundraising and development program. International Union of Superiors General was awarded $1 million to support the education and training of sisters in interculturality, anti-human trafficking, canon law and theology. Catholic Church Extension Society of USA will receive $3 million to support the US-Latin America Sisters Exchange Program Phase II-A. University of Southern California was granted $3.5 million to serve as the Monitoring, Evaluation and Learning (MEL) partner in support of the Catholic Sisters Strategic Initiative. For more detailed information on our grantmaking, please visit hiltonfoundation.org/grants. The Conrad N. Hilton Foundation was created in 1944 by international business pioneer Conrad N. Hilton, who founded Hilton Hotels and left his fortune to help the world’s disadvantaged and vulnerable people. The Foundation currently conducts strategic initiatives in six priority areas: providing safe water, ending chronic homelessness, preventing substance use, helping young children affected by HIV and AIDS, supporting transition age youth in foster care, and extending Conrad Hilton’s support for the work of Catholic Sisters. In addition, following selection by an independent international jury, the Foundation annually awards the $2 million Conrad N. Hilton Humanitarian Prize to a nonprofit organization doing extraordinary work to reduce human suffering. In 2018, the Hilton Humanitarian Prize was awarded to SHOFCO (Shining Hope for Communities), a grassroots organization based in Nairobi, Kenya that catalyzes large-scale transformation in urban slums by providing critical services for all, community advocacy platforms, and education and leadership development for women and girls. From its inception, the Foundation has awarded more than $1.6 billion in grants, distributing $114.9 million in the U.S. and around the world in 2017. The Foundation’s current assets are approximately $2.8 billion. For more information, please visit www.hiltonfoundation.org.